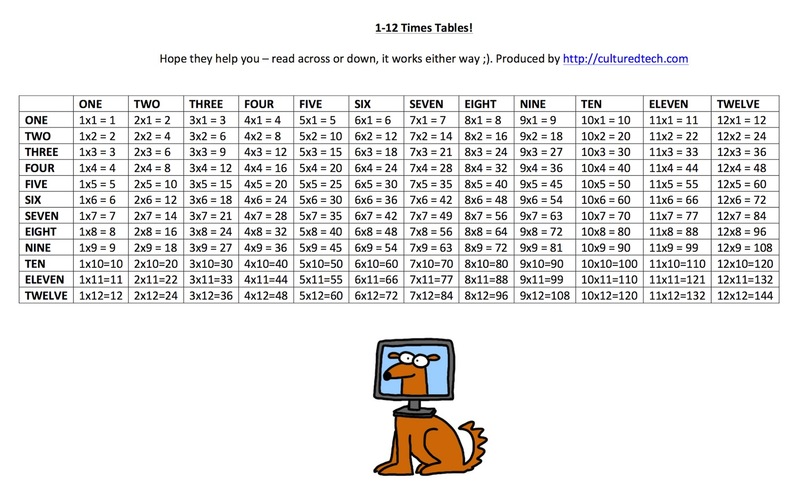 Enjoy and I hope it helps your kids learn those damn times tables. I still get a little bemused that in the 21st century this is still such a central focus but I suppose it does provide a foundation to a lot of other stuff, although there’s some debate still going on in regard to maths literacy. techniques, processes, and research results. Architecture and Urban Planning to the Arts. SLACTIONS has the format of a hybrid online and physical conference. Web and interact via a text chat applet. – A live presentation in Second Life. submit an abstract for inclusion in the digital proceedings. single contributions to theme-specific journals. invited to submit extended versions to a special Issue of the journal. submit extended versions the journal. submit an extended version to be considered for journal publication. on the proceedings publisher and journal venues for best papers. native language of that location. Check out www.slactions.org for updated lists and contacts. Congrats to Andrew Hughes and the team at Designing Digitally for their win in the 2012 Federal Virtual Worlds Challenge (see the full press release below). You can also see our own interview with Andrew from November last year right here. FRANKLIN, OHIO – Designing Digitally, Inc. took first place honors in the Familiarization category in the 2012 Federal Virtual Worlds Challenge with its 3D virtual campus tour of the United States Air Force Academy. The Ohio-based tech firm used its 3D Virtual Campus Tours product to create a virtual replica of the campus that the Air Force Academy now uses for recruitment purposes. Designing Digitally, Inc.’s submission for the challenge was two-part. The first featured the first generation product the Air Force Academy currently uses. The second included enhancements Designing Digitally made to its campus tours product following the creation of the Air Force Academy’s virtual tour. Designing Digitally’s 3D Virtual Campus Tours product is not only innovative, it’s also flexible to meet client needs. “Our system allows for multiple types of virtual campus tours, including self-guided and admission representative-led options,” explained Greg Wark, 3D & Virtual Development Team Leader. 3D Virtual Campus Tours is meant to replicate the campus experience. When creating a virtual tour, Designing Digitally makes certain that each campus is built as photorealistic as possible. The company has more than seven years’ experience building virtual campuses in 3D, which surpasses others in the industry, said Wark. The system was originally designed to serve as a solution to a problem many campus recruiters face – the cost of travel. The idea was to enable students to “travel” to a campus without having to physically be there. 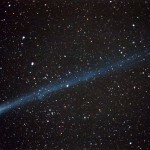 The notion being: If they can see it and enjoy it, they’ll be more likely to attend, Hughes said. 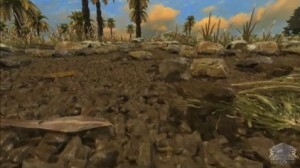 For more information, visit http://www.3dvirtualcampustours.com. I spent some time in recent weeks with John “Pathfinder” Lester, formerly of Linden Lab and now Director of Community Development at Reaction Grid. The purpose was for a walkthrough of the Jibe platform, which is a merger of Unity3D and other technologies to make a more comprehensive learning experience. I hooked up with John for a tour as I’m actively looking for a platform on which to base my upcoming research. To say the walkthrough was a revelation was a bit of an understatement. I’d made the decision more than a year ago that I wouldn’t be using Second Life as the platform for my proposed simulation environment. My reasons for that are numerous but it basically came down to fine detail – I’ve seen a few demos of the Unity3D engine in action and for what I’m looking for it’s a markedly superior option, even factoring in Second Life’s potential development path over the coming 2-3 years. So, I was working under the assumption of a Unity3D only option – until I checked out Jibe. What you’re seeing here is my avatar standing in front of a model of a virus. In this case it’s the Human Immunodeficiency Virus (HIV). I can rotate the virus, check out all it’s aspects and when clicking on it, related information (in this case simple Wikipedia entry on HIV) opens in the same browser window I’m using. Obviously it doesn’t have to be Wikipedia – the sky’s the limit. Above the Unity window are a bunch of social media buttons allowing you to share information you’re interacting with. If you refer to the Jibe graphic further above, remember that essentially anything can be bolted into the Jibe platform. 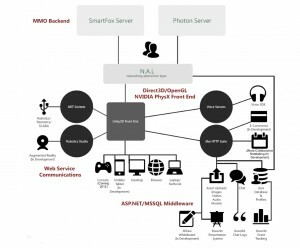 If I were to use this platform I’d be looking at some sort of database connection that allowed me to have common clinical pathways viewed step by step as an avatar completes the task. You can also choose to have key content networked or local, meaning you could ‘phase’content for people progressing through the simulation at different paces. It’s all doable, it just takes time to set-up. As far as creating content, any pre-fab stuff from the Unity3D store can be pulled into Jibe. If you’re interested in finding out more, this introduction to Jibe is useful. As far as pricing goes, check out the ReactionGrid Shop for options. After spending around an hour being shown around Jibe, it really struck me how far advanced it was as a tool for educators compared to Second Life in particular. That statement is very dependent on the type of education occurring, but for more intricate work, the Unity3D interface combined with the use of well recognised standards for better interoperability, makes Jibe a very tasty option indeed. The Australian Digital Futures Institute is powering on with its work in virtual worlds. 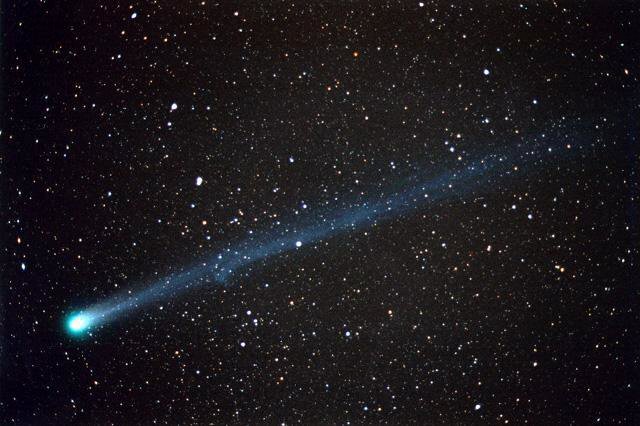 Coming up in a few weeks is their 2-day ENCKE Virtual University Collaboration (ENCKE isn’t an acronym, but a comet bringing change). This unique event will begin with an intensive two day in-world meeting. Over the following 4 weeks some of the main ideas and concepts for virtual teaching, learning and meeting spaces developed by participants will be constructed on the new virtual university island (with assistance from professional SL builders). Then over the next 3 months participants will be able to book and use these spaces for their own teaching and learning sessions, role plays and meetings. During this time there will be informal follow-up and evaluation meetings. Traditional conferences last a few days and allow for ideas to be presented and for some follow-up discussion to occur. The plan is to have the virtual university island(s) as an ongoing collaborative and space to allow for construction and testing of applications of virtual world technologies to university teaching and learning. We welcome your ideas and suggestions for this and future events. Registration: The fee to participate is AUD$325 (inc. GST) and includes the conference and related workshop, tutorial, demonstration and tour session plus 3 months access to the constructed spaces. It is expected that participants will have a SL avatar and have acquired at the least the basic skills of interacting in a virtual environment. The event is limited to 50 participants. We do expect the event to be fully subscribed so please register early to secure your place. I ran across a fascinating video via New World Notes, that shows an alternate way of rendering 3D environments. The seven-minute video provides a fascinating (albeit hyperbole-filled) overview of the atom-based approach, called Unlimited Detail. The driving force behind the project is Queensland, Australia-based Bruce Dell, working for an outfit called Euclideon (whose website is unavailable strangely). One more external pointer: Popsci covers the issue well, but it’s worth reading the comments on that article to pick up on some of the scepticism around about Unlimited Detail. Of course, whether Unlimited Detail is a near reality or a pipe dream is partly a moot point: it still raises some interesting points for me on how enhancing the current approach to graphical detail is pivotal to the success of 3D environments in a range of areas, including my pet topic of clinical simulation. Until there’s the ability to replicate complex behaviours or procedures in a graphically realistic way, true simulation will remain problematic in these environments. Let’s take even a ‘simple’ procedural simulation like inserting an endotracheal tube (ETT). The need for graphical reality is critical if any attempt is to be made to translate the practice to the physical world environment – the state of the ‘patient’, their position on the bed, the anatomical correctness of their trachea, the flexibility of the tube and so on. That;s why I’m encouraged by developments like Unlimited Detail. Of course the real test is whether it sees the light of day in environments accessible to the general public. It’s also interesting to note I’m the only author that’s not directly aligned with a University – is it really that rare for someone to contribute to an academic publication that’s not directly aligned with a tertiary institution? Of course, with the rapidity of change in the field, books like this can date rapidly but having a read-through my own chapter I think it holds up relatively well so far – that may be a different story in six months! If you do end up reading the chapter in full, I’d dearly love your feedback on it – I have no doubt I’ve missed stuff given the breadth of things underway. Over the past few months or I’ve followed the efforts of Dale Linegar and Stefan Schutt in establishing what is now known as The Lab. Melbourne-based and dedicated to providing support and skills to 10-16 year olds with Asperger’s Syndrome, The Lab is already showing some great results. It’s one of those initiatives that deserves much more kudos and funding than it is currently receiving. You’ll understand why after reading the interview I conducted with the Lab’s co-founders. David: First, a little about The Lab team. Can you give a snapshot of your backgrounds? Stefan: For the last seven years I’ve been an educator and researcher at Victoria University, working with technology and young people and teaching multimedia. Before this I worked in the Internet industry during and after the dot com boom as a content editor, producer, web developer and interaction designer. I also set up Australia’s first Computer Clubhouse, a tech skills club for underprivileged kids in Fitzroy based on the model established by the MIT Media Lab in Boston. Before all this, I worked as a writer and played in bands. Dale: I started working with Stefan at Victoria University (VU) in 2007, teaching in Creative Industries. He had a lot of faith in the virtual worlds work I was doing then, and we have collaborated on at least half a dozen projects together since. We work well together, our skills complement each other. I run a business called Oztron, which does work for VU, Monash School of Pharmacy, and a range of other clients – most involving research and education in virtual worlds. 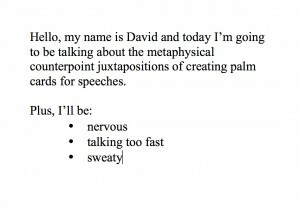 David: So what specifically has let you to working in this area? Stefan: We had taught multimedia students with Asperger’s at VU and they seemed to particularly enjoy working with technology, especially the virtual worlds activities Dale was running. This led to a trial with two teenagers in Gippsland funded by Optus Communities. The results were promising and from this we applied to VicHealth for a one-on-one research project to pilot different kinds of technologies with young people with disabilities and other disadvantages. This project found that one-on-one technical tutoring seemed to work particularly well with kids with Asperger’s, and this led to the setting up of The Lab. Dale: I think after that there were a few factors involved with us deciding to give this a go. We had established through those projects that this approach could work, and that there was a need for it. Once you reach this stage you can either publish and hope that somebody will eventually read what you write and take action, or you can give it a go yourself. The amount of money involved wasn’t huge so we decided to do it ourselves. At this time I was also meeting one young boy with Asperger’s and his mother for regular mentoring at McDonalds, we initally started at the library but were told we were making too much noise. This wasn’t ideal, and it required a lot of travel time to deal with one person. All of this coincided with my business needing a physical location to work on a few larger contracts. This has provided us with the space, the technology and the human resources required to run The Lab. David: For those not in the know, how prevalent is Asperger’s amongst the teen population? Stefan: For Autism Spectrum Disorders (ASD) in general (which includes Asperger’s Syndrome), estimates for Victoria ranged in 2006 from 27 per 10 000 to 54 per 10 000. The prevalence appears to be increasing rapidly and there is debate about whether this is due to increased rates of diagnosis or increasing numbers of people with ASD. David: Onto The Lab: it’s only just really started in earnest, what’s the journey been like to get to this stage? Dale: Fascinating and rewarding. It’s a simple idea but when you see the immediate impact it has on both the children and their parents it’s incredibly satisfying. The process actually started with myself and Stefan walking around Footscray knocking on doors asking about vacant office and retail spaces. After a few hours we had found a suitable space, and once it becomes real like that, it takes on a life of its own. It took around 5 months from that day until we opened the doors for kids. Some simple tasks have turned out to be a nightmare, like getting connected to the internet, and other things which initially seemed complex, like getting somebody who could work with the parents on board, involving our technology mentors, and attracting the right young people, have worked out better than we dared imagine. The physical space The Lab is in is also Oztron’s office, and it has been designed to encourage collaboration. 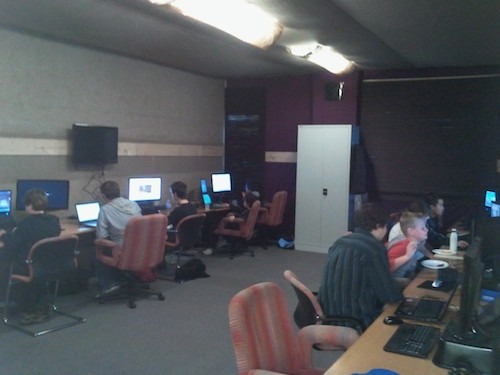 The kids are very comfortable there – it feels more like some kind of gaming den than an office or school. Stefan’s role at Victoria University and our previous project work means that we have a wide support network, and we have drawn on that throughout the process for advice and support in the many areas we lack knowledge in. David: So who is funding The Lab at present and is the funding relatively secure? 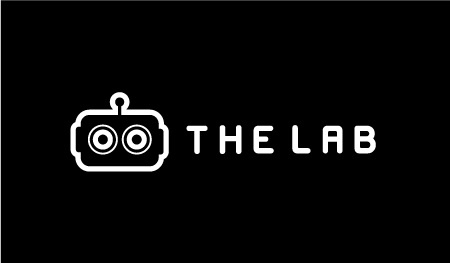 Stefan: The Lab is currently unfunded, or more accurately, indirectly funded through the virtual world software development projects Dale runs for a range of organisations, as well as small amounts of left over funding from previous VU projects. Funding may be forthcoming later in the year via a Cooperative Research Centre in youth, technology and wellbeing run by the Inspire Foundation that we’re part of – but this is yet to be fully discussed with the CRC. Until then, we’re looking for other funding sources. David: What is the scope of activities The Lab is involved in? One of the hit pieces of software so far has been Minecraft, and this has ended up serving as a social and creative outlet for the kids. For young people who need to learn about social interaction, this has been great, they need to co-operate and respect each others’ territory. Last week we introduced an Arduino, an open-source electronic hardware and software kit comprising of a circuit board that can be programmed to do specific things, starting with simple things like making flashing lights and musical instruments and going up to projects like complex sensor-based triggering and robots with avoidance detection. The Arduino proved to be very popular, and we have now ordered a few more kits. It’s a great way to introduce kids to programming because the payoff is immediate and satisfying. We also have a separate room where Stefan and Trish (our parent co-ordinator) hold an informal gathering for the parents each week. This gives both the kids and parents a bit of personal space. They can chat about issues they are having over a cup of tea, and discuss possible avenues of support. Trish has just organised for a psychologist to attend every fortnight, and we also have other experts with an interest in the field dropping by to offer assistance. David: You use OpenSim, Spore and Minecraft to name three virtual environments. Let’s talk OpenSim first: has it primarily been a cost issue that’s led to its use versus say Second Life, or has there been other advantages to OpenSim? Dale: As a business we use Opensim for nearly all of our work at the moment including Pharmatopia for Monash and a construction world for Victoria University. Second Life doesn’t provide a space where where we have total control, and people of all ages can interact, so as educators we were forced to make the switch a couple of years ago now. Like many people out there I personally have a love/hate relationship with Second Life – I love the possibilities it has created, but I have issues with the way it has been managed and promoted. David: So what exactly are you doing in OpenSim? Dale: We haven’t really introduced it to the wider group at The Lab because we are waiting for that opportunity to present itself, it’s up to the kids. We will run our own Opensim world which will be available to the group only – the plan is to create 8 islands and the rest is up to them. 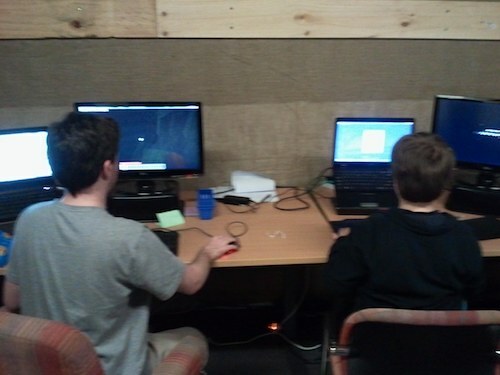 Many of the young people with Asperger’s we have worked with over the past couple of years continue to use Second Life. One young lady is using Second Life to bring her characters to life. She has written an amazing story about a group of female superheroes, and drawn pictures, and is now using the virtual world to bring her characters into the third dimension. Another young man we work with has his dream house in Second Life and is constantly renovating, he lives in rural Victoria so for him it’s a great escape. We have also used Comic Life quite a bit in the past and will probably introduce this to interested Lab participants at some stage. David: A common criticism of OpenSim (and Second Life) is the initial learning curve: has that been a greater or lesser issue with the teens you’ve been working with? Stefan: Yes and no. What surprised us in our last project is how much Second Life and OpenSim rely on text-based navigation. We’d always thought of them as visual interfaces until then, but as we found out when working with kids with very low literacy levels, so much of the navigation is achieved by typing in text, which can cause issues for some kids. For others, they’ve taken to it like ducks to water, especially the younger ones. We also wonder whether the ‘learning curve’ referred to is related only to the ‘end user’ or also the people running the activity (ie teachers and managers) – this is where a lot of the problems seem to arise in terms of access, web speeds, and associated lag, plus generational issues like people not used to navigating in 3d or navigating via arrow keys like, erm, me. I always get Dale to do the practical demos because I’m so unskilled at it! David: Now onto Spore: how are you using it? Dale: We only use the free creature creator, firstly because it’s free, and secondly because it’s all about being creative. It’s a great icebreaker, many of the young kids we work with have already played it, and it acts as a catalyst for communication. It also gets kids into a more creative frame of mind, to feel the pleasure of making something as opposed to getting stuck competing in other games. Dale: It can appear to an outsider as one of those ‘click-click-click’ games but when the kids are playing on a server together it allow for some wonderful creativity and encourages communication and collaboration. One of our mentors has built his own computer in it and knows it backwards, and the kids respect this. David: Has Minecraft been a bit of a revelation for the work you are doing? It sort of came out of nowhere and has caught on quickly. Dale: It has been surprising how many of the kids enjoy it, I think every one of them has played it at some stage now, and there are regularly 5 or 6 of the kids on the server during our sessions. There is a lot to learn, so I see it as the group exploring a new territory together – in this case a virtual one. They feed off each other and go on journeys, learning things they might not learn alone. David: Talking more broadly again now, what are the individual benefits and outcomes you’ve seen so far amongst the participants? Stefan: One big factor so far seems to be the environment of The Lab – i.e. a space where young people with Asperger’s are not picked on (unlike school, where bullying is constant), where they’re accepted and where being a ‘geek’ is even cool, and where they are surrounded by other people like them – both other kids and the programmers who are a kind of role model. Also, where their parents aren’t hovering the whole time! They’re relaxed because they’re not pushed to do anything, or to interact if they don’t want to. They can sit happily at the screen without being bugged – but the expert advice is on hand whenever they request it. Having said that though, the level of kid-to-kid interaction to date has been quite amazing – here we’re talking about kids who don’t have any friends at all in the outside world, but who are happily chatting away and playing with others, both in-world and in the physical space. Another factor is the technology itself, and the presence of experts to whom they can look up and respect (they usually run rings around other adults when it comes to IT). Tied to this is the sense of possible future careers, and a way into the future. This is very powerful – already we’ve heard reports of one parent halving her child’s anxiety medication dose due to his reduced anxiety levels about his future. David: Let’s talk research: is there an underlying research methodology being used for The Lab? Stefan: We would classify our approach as ‘participatory action research’ – our focus is on hands-on outcomes driven by all stakeholders in collaboration, and implemented (and continuously improved) by all involved. It’s based on making a real difference to real people’s lives rather than sitting back as the researchers in the white coats. It’s proudly interventionist and practical, and has a strong element of social activism. David: Are there specific research projects underway and if so can you give a brief overview of any? David: What are the measures of success for you with The Lab? Stefan: In the short term, happier kids, happier families, and a sense of progress amongst participants. We rely heavily on feedback from the kids and the parents. It will always be tough to measure our impact in a quantitative way as each of these young kids is so unique and we are only dealing with small numbers. It’s not like we can create a control group. But we are looking to work with experts in the Autism field who may be able to measure the effects on individuals and their families over time – this is where the Cooperative Research Centre, and its 70 or so partner organisations, will hopefully come in. 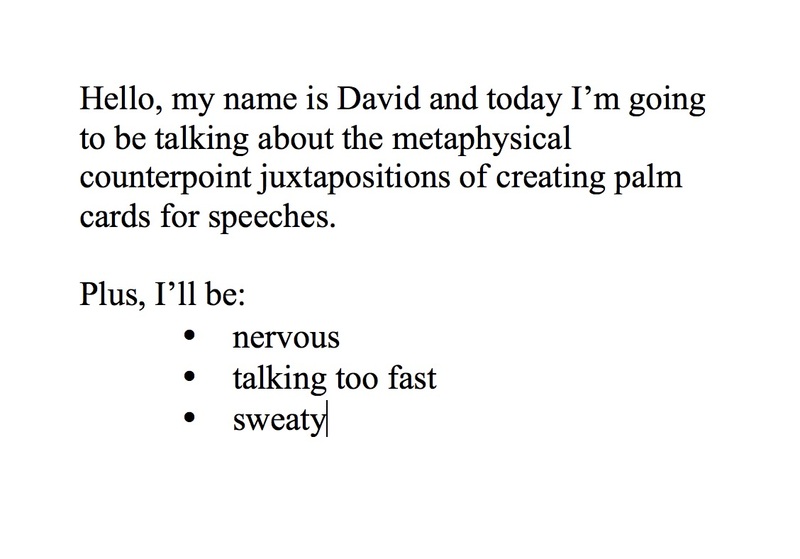 David: Are there any qualitative or quantitative outcomes you’re able to see already? Stefan: Yes. We’ve already had remarkable email and verbal feedback from participants’ parents about their children’s improvement, only three weeks into the beginning of the program. We also have 20 plus kids on our waiting list. Other parents have been ringing us daily after finding out about The Lab. It seems to have really hit a nerve. As stated previously, we’d like to get other measures too, working with field experts. David: Given the central use of virtual environments in the program, are there any plans to expand the program geographically? Stefan: Currently The Lab has three interlocking elements that work together: participant socialisation, technical tuition and parental networking/support. Any of those three elements would be useful in themselves (for instance, we’re arranging for a software engineer to undertake private volunteer programming tuition with one of the kids on our waiting list), but the combination of the three is especially powerful. So we could run virtual programs, and they could be useful, but some of those three elements might be missed. Dale: My feeling is that having personal contact is still important in modern society, in this case for both the kids and their parents. We hope to build online resources which can help people at home, but nothing beats a one-to-one conversation with somebody who knows what they are talking about. I hope that we can inspire other real-world institutions to become involved. David: Getting out the crystal ball now: what are you hoping The Lab has achieved a year from now? Stefan: What we are striving for is an effective model that can be replicated in other places and can positively influence the way society thinks about these kids, particularly in the education system which seems to be manifestly unsuited to a group of young people who are very talented. Dale: Currently so many of the young people and their parents simply have nowhere to turn – they are stuck between normal schools and special schools, neither of which meet their needs. These people have a lot to offer to society – we deal with kids who can program their own games, but aren’t able to attend school and are at risk of being disadvantaged their entire lives. I hope that we can help support people and organisations who are interested in adopting this type of model, and I hope we can expand and deal with more kids more regularly. We live in an age where we have the opportunity to use technology to create positive social change, and we are enjoying every moment of it. 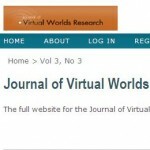 The latest issue of the Journal of Virtual Worlds Research has been out for a few weeks now, and I’ve been meaning to posts a synopsis, so here’s exactly that for the peer-reviewed articles in Volume 3, No.3, with some horribly abbreviated summaries of findings for those too lazy to read the articles or the abstracts themselves. A detailed cross-discipline review of research on presence. 97 citations were found across Mass Communnications, Human-Computer Interfaces, Education and Psychology. Findings: there are very different perspectives on the issue depnding on the discipline and that an agreed framework for understanding the area is needed to move forward. 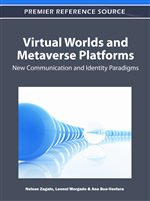 A very interesting look at how one effectively captures user-to-user communications in a virtual world environment. There’s a focus on establishing accuracy and three methods of collecting data are assessed within a Japanese MMO, Uncharted Waters Online. Findings: All three approaches explored are statistically viable and the choice of method depends on the individual research. A detailed look at a Second Life-based health initiative tackling obesity. An in-world exercise program, health information and social support was provided with promising outcomes. Challenges and opportunities of the approach are outlined. Findings: Good participation occurred, there were challenges in recruitment and retention and technical hurdles with Second Life were a barrier to a number of potential participants. Further research is recommended on optimal in-world exercise programs to deliver physical world results. It’s fair to say that the research being undertaken continues to grow, although I remain a little concerned at the level of research demonstrating detailed qualitative or quantitative outcomes. It’s happening, but unfortunately at this stage the industry is still very fragmented and disseminating that information is challenging. 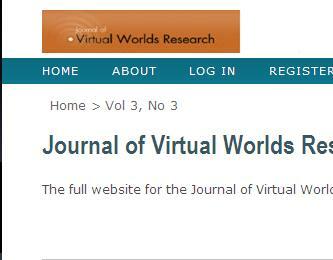 Journals like the JVWR are obviously helping in that regard.